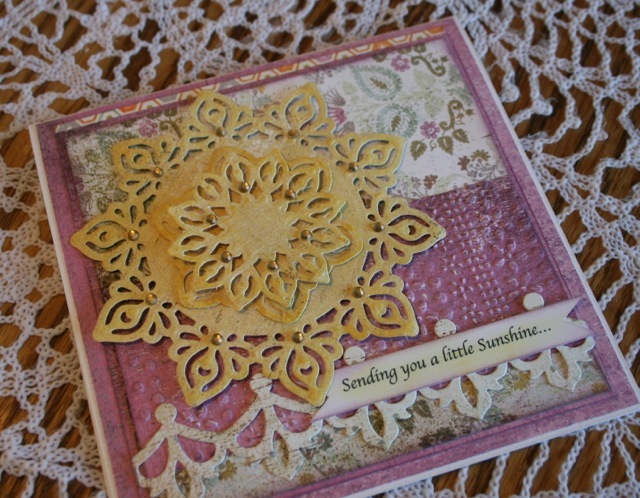 of sunshine and relaxing and lots of time for scrapping too! made it really easy to put it together this week. just so adorable and I think the papers went perfectly! 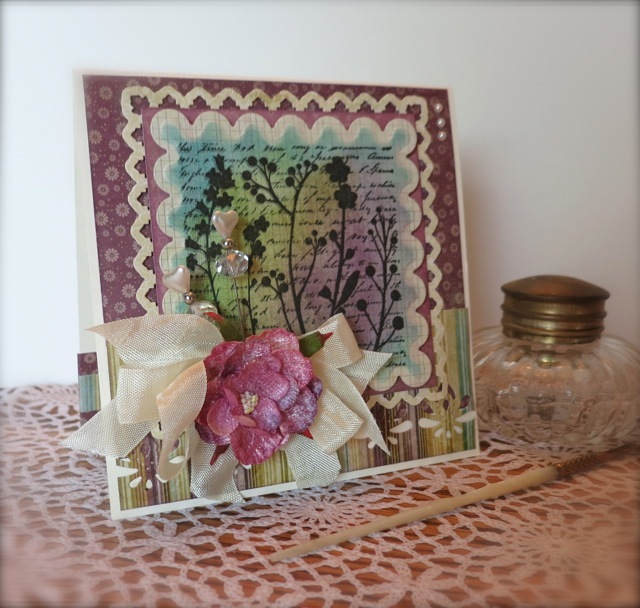 and of my Spellbinders Carnation creations. 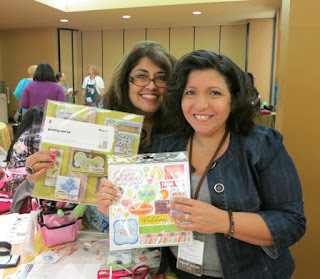 us for a chance to win a prize! scraps I had in my stash from the Kitchen Spice collection. 3 Patterned papers, 2 stickers and 1 Brad/Button on your card. had a really great Memorial weekend! put me in a bright and cheerful mood! 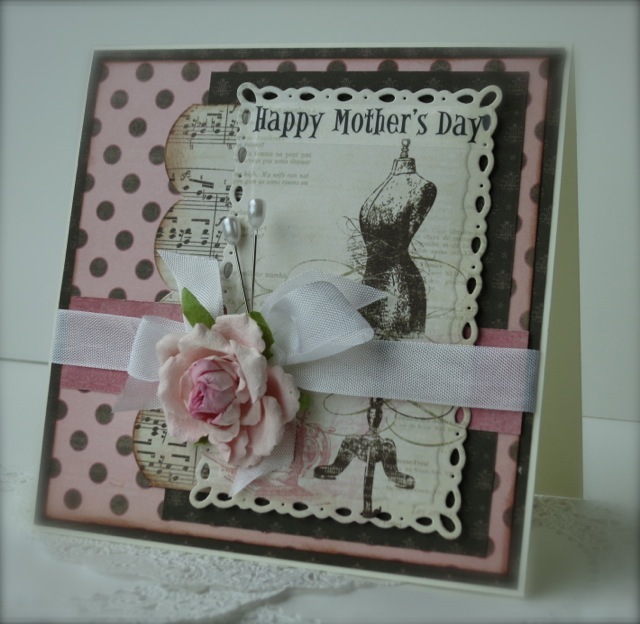 For my first card I cut 2 print pieces for the backround. Then i cut a paper ribbon in blue dot and flagged the bottom. with a few tiny white pearls and a cute white bow. no other dies can do... They are really fantastic!! 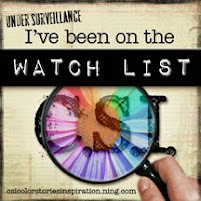 Here is the link to see them all here. 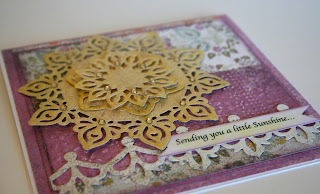 die S4-348 and cut and embossed it for the back round. I just Love glittery things! some dessert tonight and watch a movie! 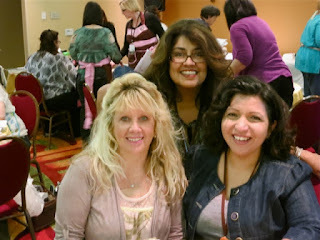 fun with all the girls there!! They were all so very nice! and 1 from Pink Paislee and 1 from 7 gypsies! and not teaching and we got to create 2 awesome books Sat. And this adorable teacher is Rebecca Cross. 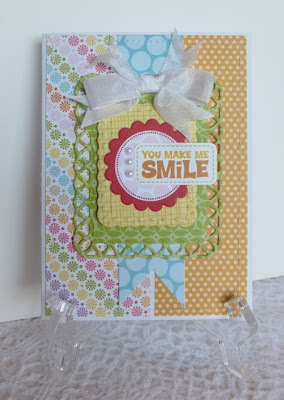 to do and they are just so darned cute and fun to make. embellishments on the ones we did. It was really fun! to get our projects all done! 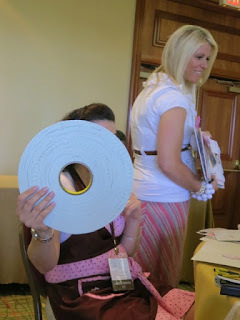 roll of foam tape that I had ever seen! could be there every day LOL! it's a love hate relationship though LOL! Thanks for stopping in and sharing in the fun! Laughter truly is the best medicine! it with Copic markers and a little bit of distress ink. Fleur de lis Rectangles S4-317. 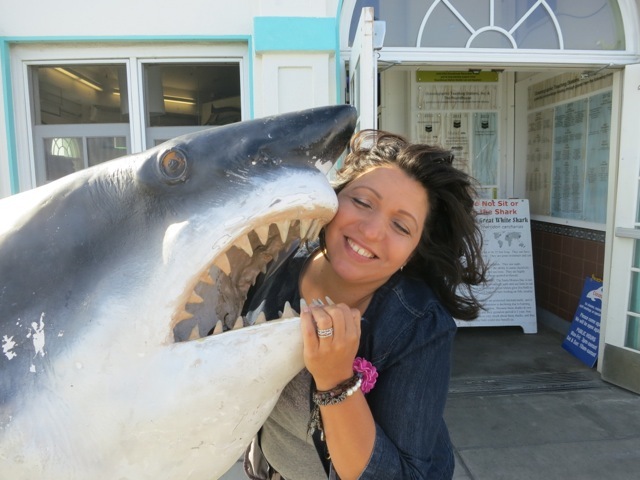 by the beach... it's going to be a fun weekend! 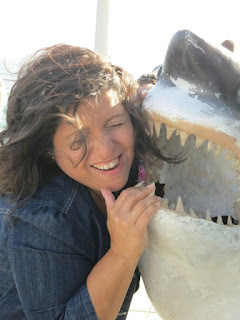 own take on it and enter to win a fantastic prize too! My title is "our adventure in Venice"
and a few extra tickets and letters for my title. all the beautiful flower stands there on the island. It was a really, really fun trip for all of us. and be sure and join us and upload your page too! and papers by Basic Grey. but also because it is easier to store too!! tiny embossing details of these wonderful products! 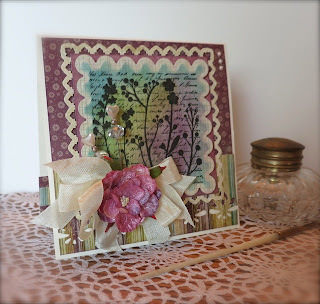 today for a little Spellbinders inspiration! 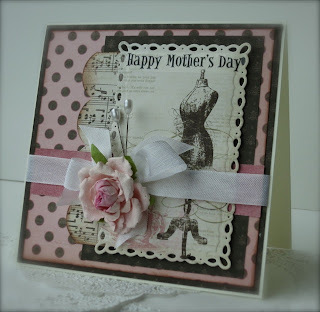 to all the wonderful moms out there! a special mom, aunt, grandma, or sister in your life! 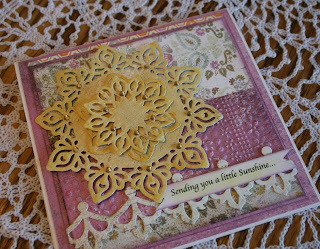 Spellbinders die Romantic Rectangles S5-090.--- It's soo pretty! bow with an old fashioned rose and a few stickpins. 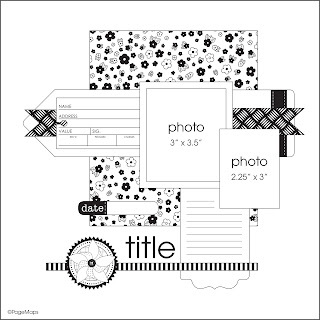 inset to have as a backdrop for the Mother Tag from MME. This was a really fun card to make so I saved it for last. just so the purple was peeking out under the edge. ribbon and a flower and a few stickpins and it was all done. I can send them out for Sunday.. Yay! 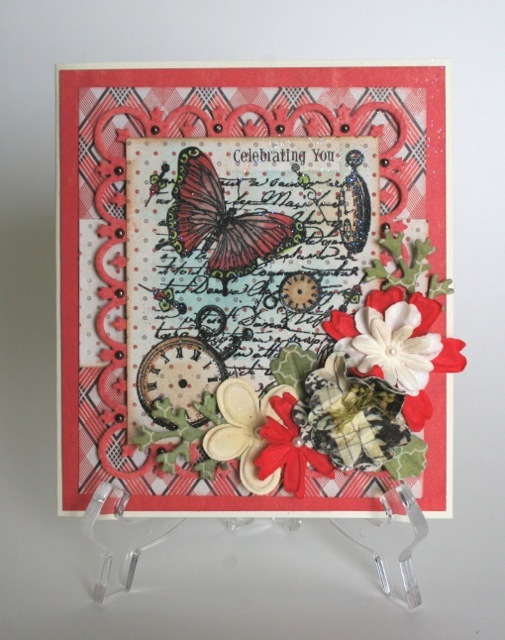 some of these amazing dies to play with! 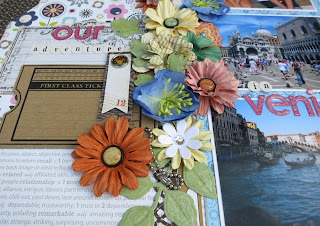 Welcome to our first hop with the new Spellbinders Design Team of 2012. 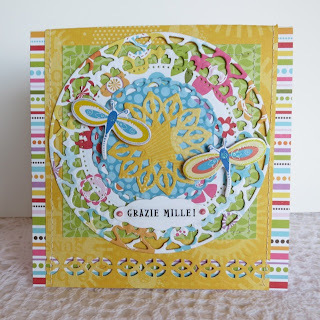 I hope that by now, if you have been hopping with us, you are brimming with lots of creative ideas on how to use our fabulous New Spellbinders™ dies. I have a fun project to share with you today for all the Senior Grads in your life --so grab a cup of tea and sit a bit while I teach you how to make this book with our New Tags and Labels Die from Becky Fleck and the Creative Book Pages Dies from Donna Salazar. 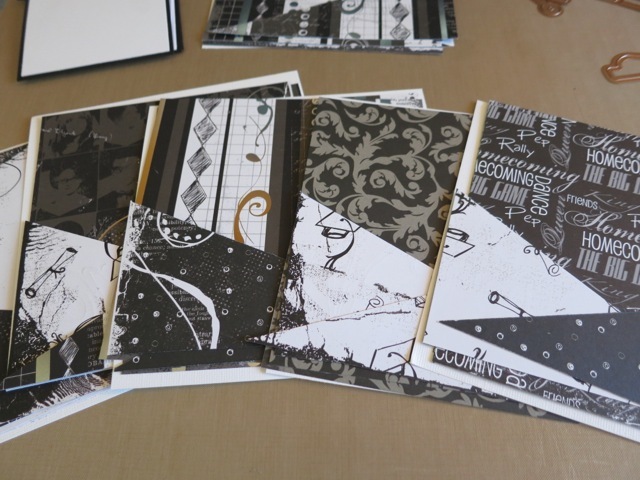 Cut 2 more pieces out of the black textured cardstock with the scalloped book pages (set 1) and emboss them. Cut 4 pieces of 1” x 6 ½” for the front and back inside and outside edges to bind. Set these aside. Cut and emboss the silver diamond paper with the creative book pages and glue onto the front piece of the scalloped black book page. 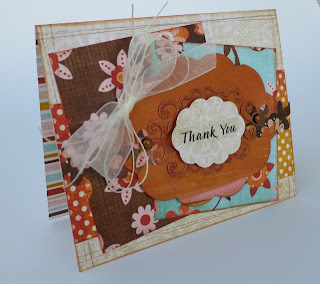 Cut a square of 5 ¼” x 5 ¼” of the school color you would like to use. Cut the year print 5x5 and glue this on top of the colored cardstock. I added foam tape between the colored and black layers to make it stand out more at this point. 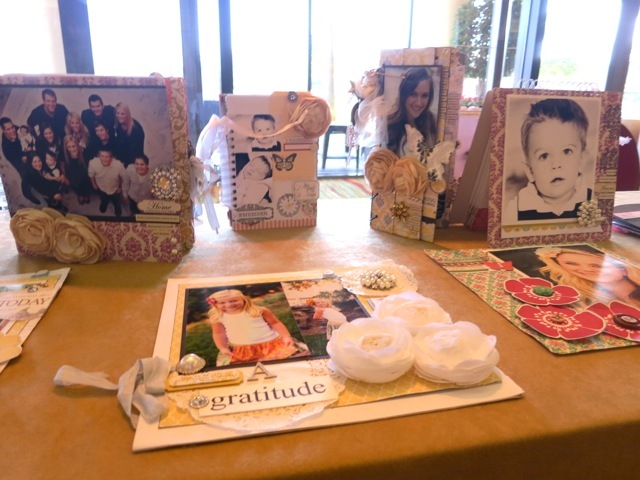 You can mat your photo in white and glue this down on top of the other pieces. 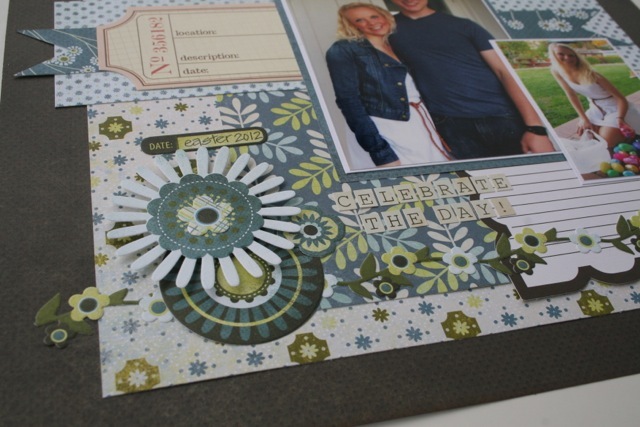 Cut out 3 tiny ticket tags, 2 flowers and a tab out of white cardstock and emboss them. If you have stickers that work great you can put them on the tags or you can print it on your computer and lay the dies over the top and cut and emboss them so that you can use words that would personally fit your project. Set this front finished piece aside with the black pages. 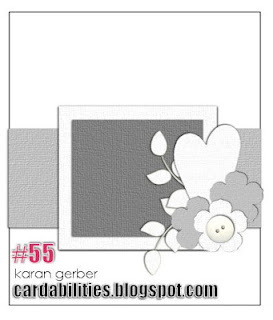 To create the pocket inside pages you will cut 12 pieces of white cardstock 6x6. 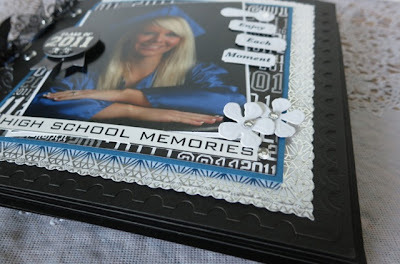 Cut 12 pieces of Graduation themed papers 5 ¾” x 5 ¾” square and center them and glue them down onto the white pieces. 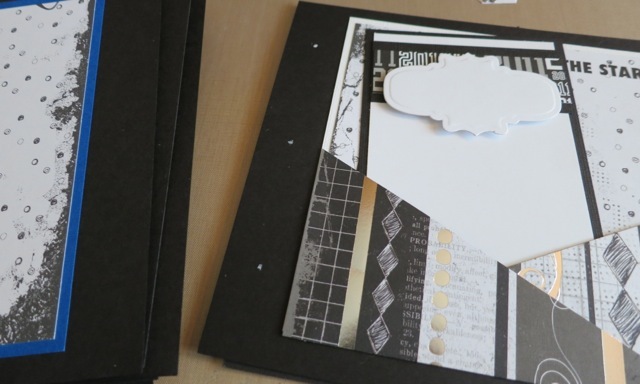 To make the pockets you are going to cut 12 pieces of printed cardstock 3” x 5 ¾” You are going to cut these at a slant making sure that you have 2 pieces that criss-cross together making enough for 6 pages. 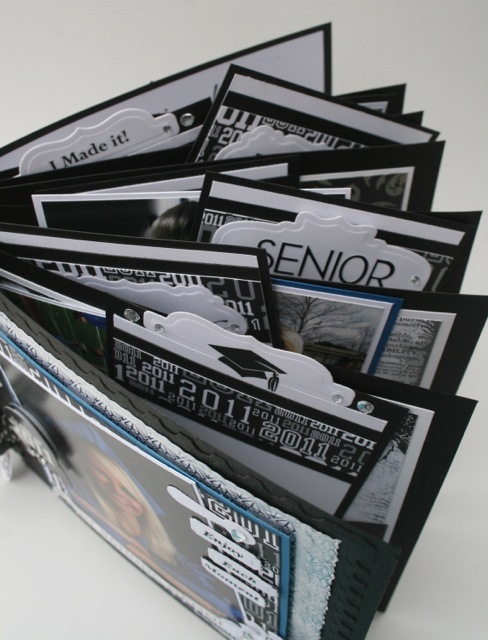 Glue these down with ¼” Scor tape around the outside bottom edges to create a pocket to put the tags, photos and memorabilia in… See photograph below. 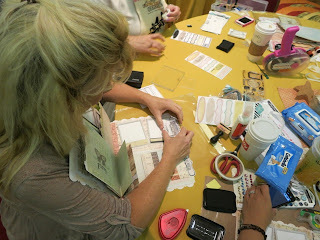 Now we are ready to create the journaling tags for the pockets. 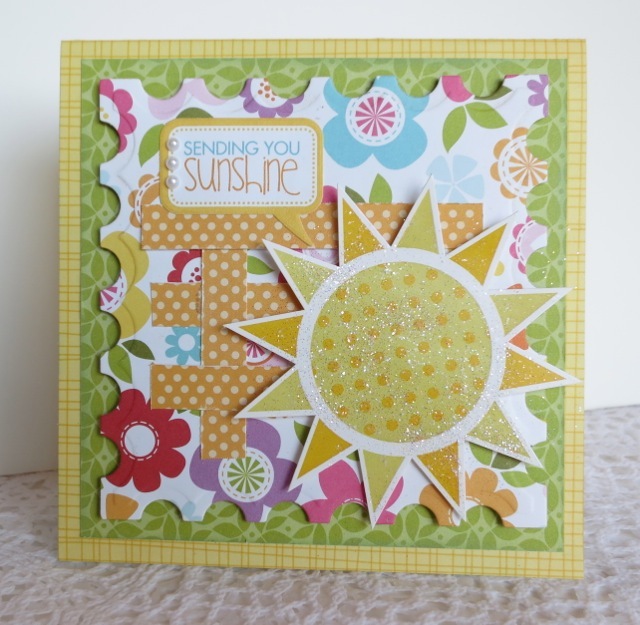 For these you are going to cut 6-8 white rectangles 3 ½”x 5 ½”. Cut black mats for them out of cardstock 3 ¾”x 5 ¾”. Glue together. 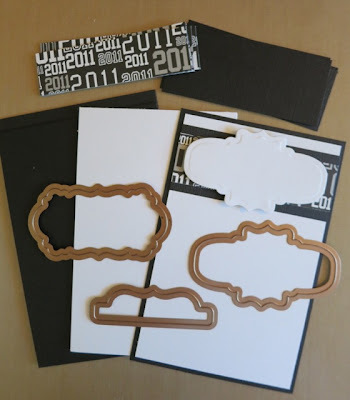 Cut 6-8 pieces of black cardstock 3 ½” x 1 ½” and glue ½” down from the top on the white cardstock. 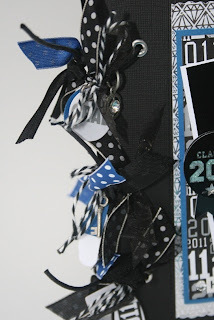 Next you are going to cut 6-8 strips of the year themed paper 1”x 3 ½” and glue that on top of the black. 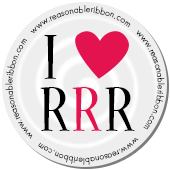 To make the adorable tags you will cut and emboss 2 of each tag and add the lettering either by rubons or adhesive letters. 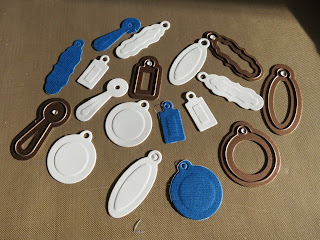 You can add foam dots on the back of each and adhere them onto the tags. Add rhinestones to each tag. You can click on the pictures to see more detail in the photos. Now we are ready to assemble the book. Figure out where you want to holes to be on the left edges and make yourself a template. I did 3 holes and marked each of my pages first with a white pencil and then punched them so that I could add the silver eyelets. (These will help reinforce the pages when they get turned.) When you are done adding the eyelets you can string the book together with the black cording. Make sure that it is not too tight so that you can turn the pages easily. 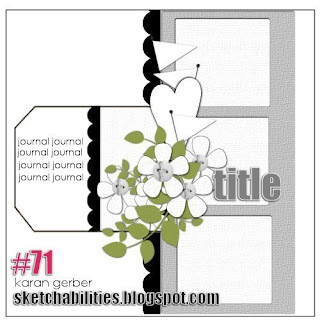 Add bits of ribbon and cut tiny little tags in white and emboss them and tie them on with ribbons. 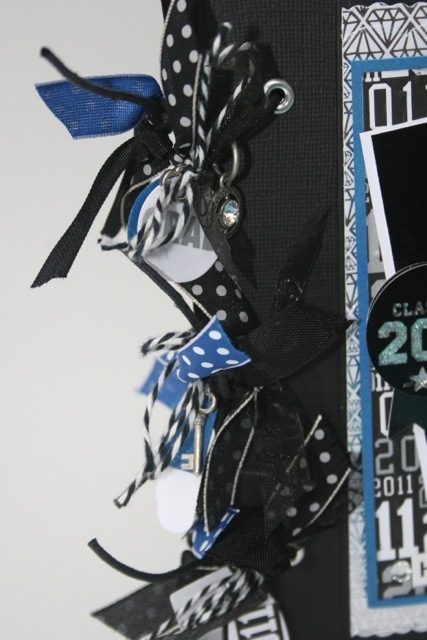 You can add the name of the student, school name, year or just words onto the tags to decorate..
To finish your book you can mat photos or announcements or whatever you have collected from the year to put on the pages and in the pockets to make a priceless book for them to remember that very last year of high school or college. I added stickers and extra embellishments on the pages too so have fun with it and please email me if you have any questions. 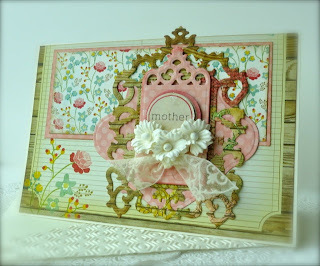 The Spellbinders™ Spring Blog Hop will begin April 30th, and will end on May 5th, 2012. It consists of 16 individual and one grand prize drawings. 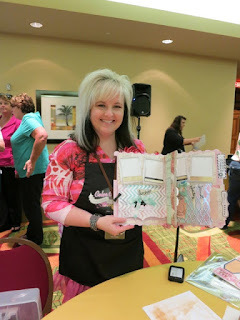 Enter the Spellbinders™ Spring Blog Hop by visiting the participating blogs each day. 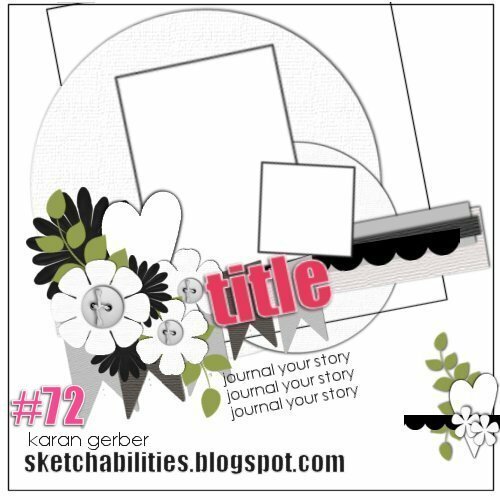 From each Blog Hop post, click on the Blog Hop "Enter HERE" at the end of each blog to open the entry form. 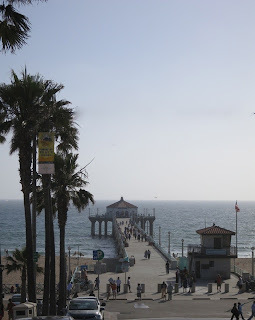 You may only enter once from each blog each day. Spellbinders™ will randomly draw one winner from each participating blog to receive all of that day’s products. The Grand Prize Winner will be randomly drawn from the pool of entrants that sent entry forms from each and every participating blog during the 48 hours each blog was open. For the full list of official rules please click RULES. Thanks so much for visiting my blog today and I hope you got inspired to create something fun with these fabulous dies from Becky Fleck and the wonderful Book Page dies from Donna Salazar! I’d love to have your comments… but to enter and win… you must click the contest link above. No entries will be accepted at this email address. chance to win a copy of Courtney Walsh's new book. Yay! thanks to Becky's wonderful and cute sketch. help Becky with her Relay for Life Run!